Timmy and Tommy jumped up and down. Mama was taking them to the beach today. She bought them each a shovel and bucket and a new pair of swim trunks. “Hurry, boys. We want to get to the beach before the tide come in. That way you can build a big sandcastle. Off to the beach they went. There weren't many people there so they had a lot of room to play. Mama set up her chair and umbrella and sat reading a book. Timmy and Tommy grabbed their buckets and shovels and ran down close to the water. “Look Timmy, there's a seashell.” Tommy ran to get it before the wave sucked it back into the sea. “Here's another.” He picked that one up too. Tommy found three seashells. They ran to their mama and left them sitting in the sand next to her. 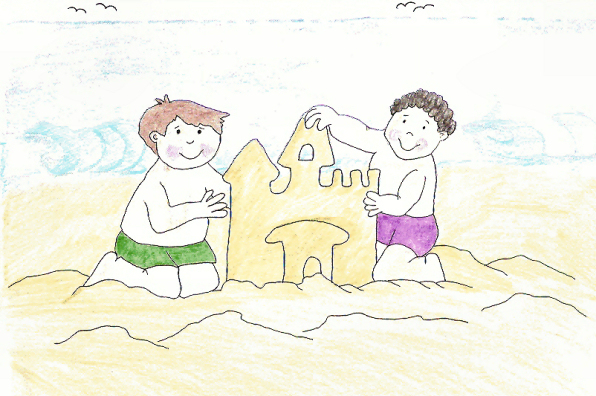 “I think I can build a bigger sandcastle than you can,” Timmy said. “No you can't. My sandcastle will be bigger than yours.” Tommy started filling his bucket up with sand. He dumped it over once it was full and filled another. Timmy pushed sand into a pile with his bare hands and then when it was big enough he started putting some into his bucket and building towers around it. They worked for an hour. Mama watched in horror as a wave rushed in and knocked both boys sandcastles away. Tommy cried and Timmy cried. They ran to their mama. “At least we've got our seashells,” Tommy said. Mama felt bad. She'd just thrown their shells back into the sea, not knowing who they belonged to. “I think we should gather some more.” Mama ran down to the waves and whenever a shell bounced in, she picked it up and washed it off. Tommy and Timmy did the same. Soon they had two bucket's full of shells. They carried them back to the chair. Both Timmy and Tommy had forgotten about their other shells and Mama was glad of that. “We can build another sandcastle next time we come, Mama, but we'll make it far away from the waves.” Tommy hugged her. Mama laughed and took both boys by the hand. They held their buckets of seashells in the other.